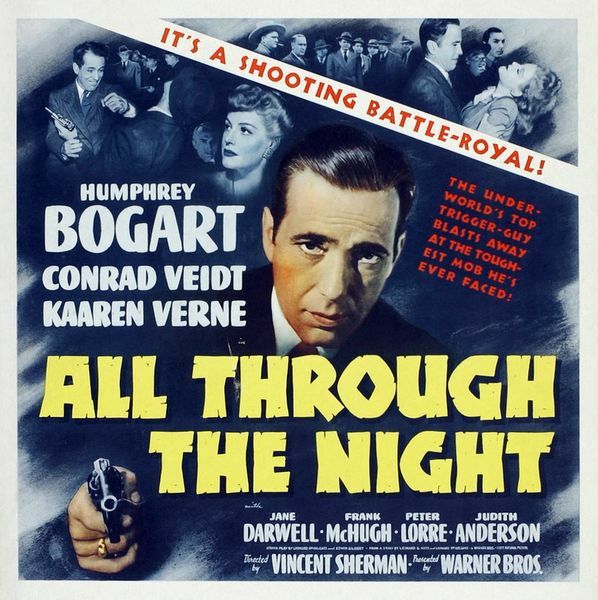 A gang of Runyonesque gamblers led by Humphrey Bogart take on Nazi spies in ALL THROUGH THE NIGHT, Bogie’s follow-up to his breakthrough role as Sam Spade in THE MALTESE FALCON. Here he plays ‘Gloves’ Donahue, surrounded by a top-notch cast of character actors in a grand mixture of suspense and laughs, with both the action and the wisecracks coming fast and furious in that old familiar Warner Brother style. 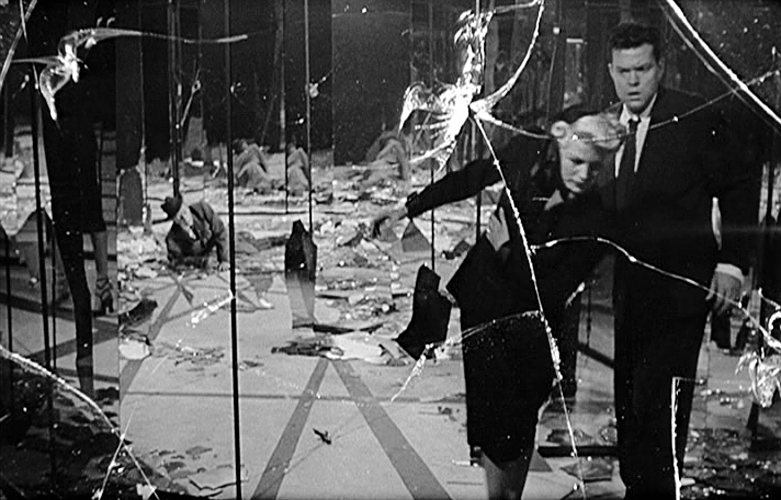 Studio workhorse Vincent Sherman, whose directorial debut THE RETURN OF DOCTOR X also featured Bogart, keeps things moving briskly along and even adds some innovative flourishes that lift the film above its meager budget. Bogie’s gangster image from all those 1930’s flicks come to a humorous head in the part of ‘Gloves’. He’s a tough guy for sure, but here the toughness is humanized by giving him a warm, loving mother (Jane Darwell ) and a fondness for cheesecake (the eating kind, though he loves the ladies, too!). 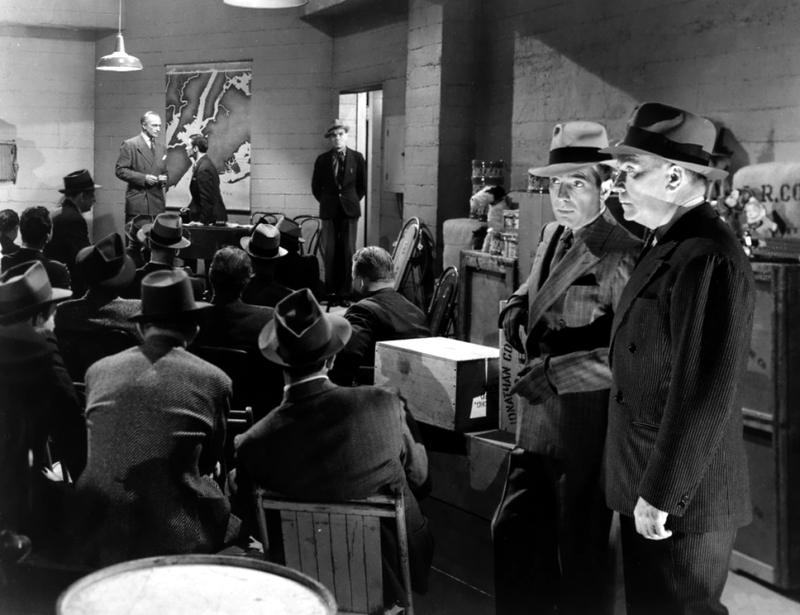 ‘Gloves’ and his cronies (William Demarest, Frank McHugh , and a young Jackie Gleason!) get embroiled in the murder of local baker Miller (Ludwig Stossell), with the notorious ‘Gloves’ as prime suspect. 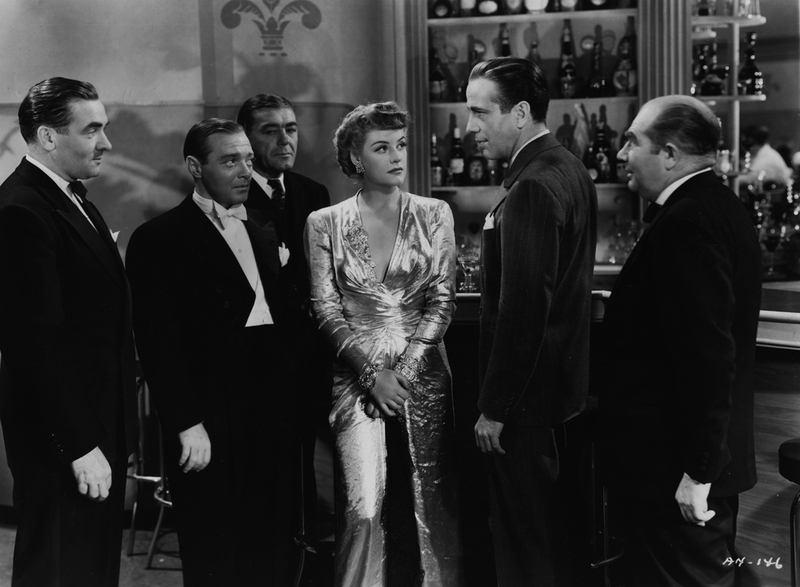 A mystery woman (Kaaren Verne) leads the gang to rival Marty Callahan’s (Barton MacLaine) nightclub, and intrigue involving a nest of Fifth Columnists led by Conrad Veidt , Peter Lorre , and Mrs. Danvers herself, Judith Anderson ! There’s a truckload of hilarious one-liners (some a bit dated) and some clever Code-bending double entendres, most of which center on newlywed McHugh’s plight. Sherman and DP Sid Hickox stage a novel and well shot fight in a freight elevator between Bogie and an Axis spy that’s very noir-ish in its execution. A scene Sherman dreamt up features Bogart and Demerest infiltrating a Nazi sympathizer rally and giving the Krauts the “doubletalk”. 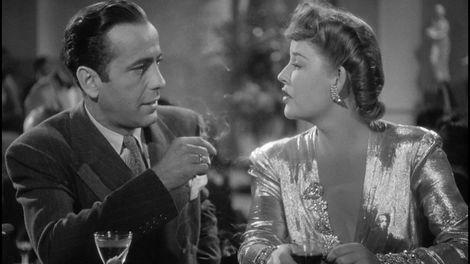 This scene, mostly improvised by the two stars, was ordered cut by studio boss Jack Warner, but when test audiences reacted positively to a snippet Sherman purposely left in the mogul relented. I’m glad he did, because it’s a very funny bit, allowing Bogie to show off his comedy chops! 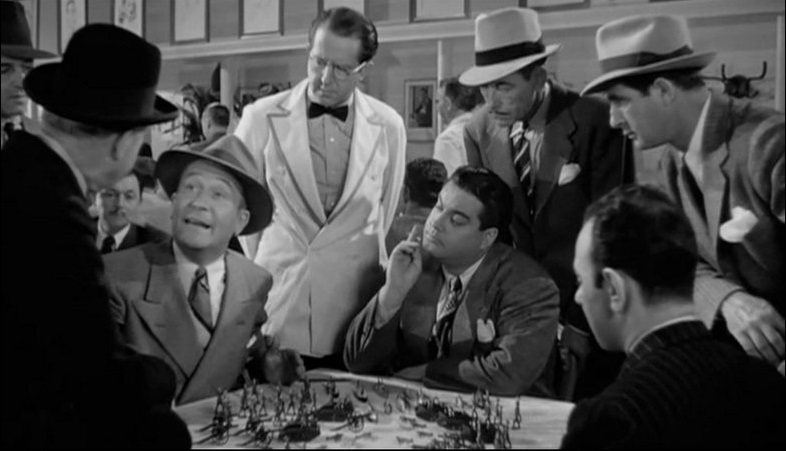 Veidt, Lorre, and Anderson all excel as the bad guys, and the two male ex-pats would later join star Bogart in my favorite film, CASABLANCA . Kaaren Verne is quite good as the mystery woman, who of course is not what she seems. Miss Verne was in Sherman’s previous anti-Nazi film that year, UNDERGROUND, and acted in KING’S ROW, SHERLOCK HOLMES AND THE SECRET WEAPON , and THE SEVENTH CROSS before marrying costar Lorre and retiring from the screen. After their divorce in 1950, she made a brief comeback in movies and TV, including a memorable TWILIGHT ZONE episode, “Death’s-Head Revisited”. It’s too bad she wasn’t given a higher profile during her Hollywood career; she’s both skilled and beautiful, and with the right part could’ve probably been a big success in films. The supporting cast features a pair of comics who later gained success in the world of television. Gleason, billed as Jackie C. Gleason, shows glimpses of his comedic talent; he wouldn’t make it in films until after he was firmly established as a top TV comic. Louie the waiter is played by Phil Silvers , who fared slightly better in movies, but did much better after bringing SGT. BILKO to life on the small screen. Familiar Face spotters will have a field day with this one, as Jean Ames, Egon Brecher, Ed Brophy , Walter Brooke, Wally Brown , Chester Clute, Wallace Ford, William Hopper, Martin Kosleck , Sam McDaniel, Emory Parnell, Frank Sully, Philip Van Zandt, Henry Victor, and Ben Welden all appear in small roles (some of them of the blink-and-you’ll-miss-him variety). ALL THROUGH THE NIGHT is one of those enjoyable 40’s films made in an innocent time, where even gangsters rallied ’round the flag for freedom against the Nazi menace. It’s colorful dialog and cast of pros make this a fun vehicle for Humphrey Bogart, on the cusp of superstardom after years of toiling in secondary parts for the Brothers Warner. 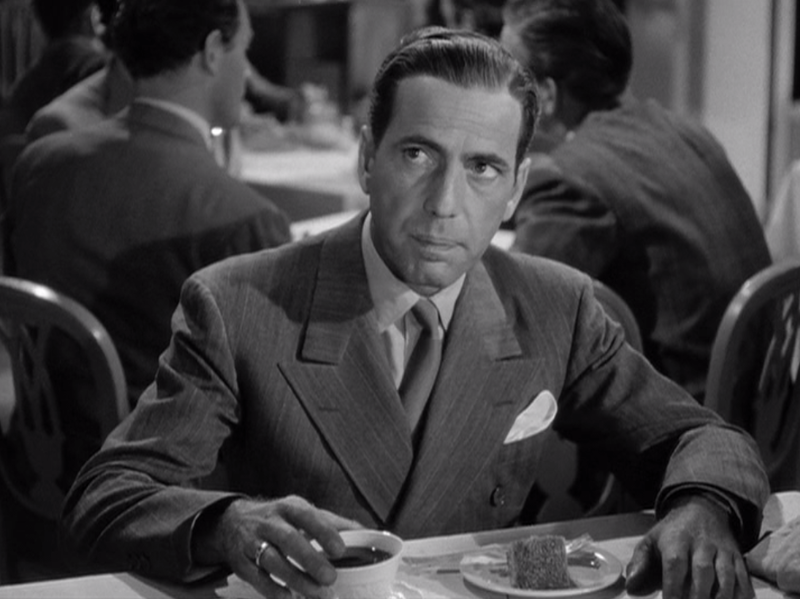 Soon Bogie would be travelling to CASABLANCA and achieve even greater success, thanks in large part to his work in films like ALL THROUGH THE NIGHT. Movie lovers like yours truly are forever grateful! Bogie is one of my favorite gangsters. He is up there with James Cagney. I saw All Through The Night last week on the Turner station and enjoyed it thoroughly. It is GOOD!!! I watched it do, thoroughly enjoyable! Slowly working my way through his films. Never realised how many top rated movies he had made. I might be late to the party but it’s more the fun for it. This one has been added to the list. Sounds like a heap of fun…… Looks sheepishly from side to side and whispers “I watched The Maltese Falcon for the first time last week” yep I know I’ll get my hat!